I remember sitting with a group of friends back in 2012 and downloading an early version of Snapchat. We laughed and deleted the app. Four years later, and Snapchat are the ones who are laughing. Their app is now worth a staggering $20 billion, they turned down an acquisition offer from Facebook, and they’ve got more more users than Twitter (100 million, to be precise). That last one might surprise you: more users than Twitter. In fact, Snapchat grew more in 2015 than Twitter grew in four years. Businesses are still pouring much more time and effort into promoting on Twitter, when Snapchat is actually bigger and more engaging. Is it time to start marketing your business on Snapchat? We’ll start this article with a few statistics that might just convince you. Then we’ll take a look at some of the most successful Snapchat campaigns, and – finally – I’ll explain some of the real, actionable ways you can use Snapchat as part of your mobile marketing campaign. For marketers and entrepreneurs, Snapchat isn’t as simple as Twitter, Facebook or Instagram. But those that dig deep enough and get the hang of it are richly rewarded. Snapchat videos are viewed more times than Facebook videos (10 billion per day compared to Facebook’s 8 billion). These views are currently increasing 400% year on year. Adverts on Snapchat are viewed 1 million times every day. Snapchat is growing faster than any other social media platform, ever. It’s already surpassing Facebook and Twitter statistics, and it hasn’t peaked yet. 60% of all smartphone users aged 13-34 use Snapchat. This year, the app replaced Instagram as America’s second favorite social network (Facebook is still way out in front). Snapchat is one of the very best ways to reach the hallowed millennial age group. These 18-34 year-olds are the most active sharers and promoters, and they spend a collective $600 billion every year. They are also notoriously the most difficult to reach and influence, yet they use and trust Snapchat in their hoards. Who else is using Snapchat marketing? Despite its enormous size and potential, businesses and marketers have been slow to latch onto its power. However, there are some success stories we can learn from, not least The White House! Yep, President Obama himself uses Snapchat to keep followers up to date with behind-the-scenes snaps from the Oval Office. 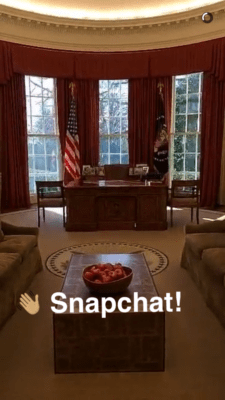 The White House are using Snapchat as part of their campaign to ‘meet people where they are”. Simply put, it means they aren’t waiting for followers to find them, they’re actively going out there and connecting with people on the platforms and apps they’re using every day. And that’s something that every business – big and small – should be doing. Cleverly using Snapchat’s disappearing images, the WWF posted a series of images about endangered species. 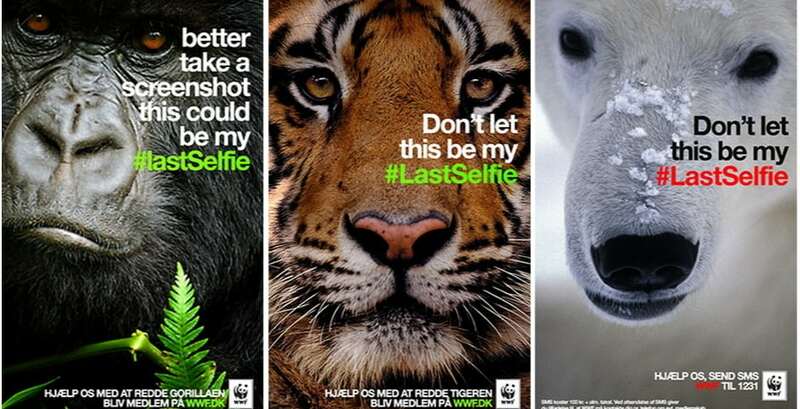 Using the hashtag #LastSelfie, the WWF posted disappearing images of Gorillas and Polar Bears urging viewers to take action before they disappeared for real. 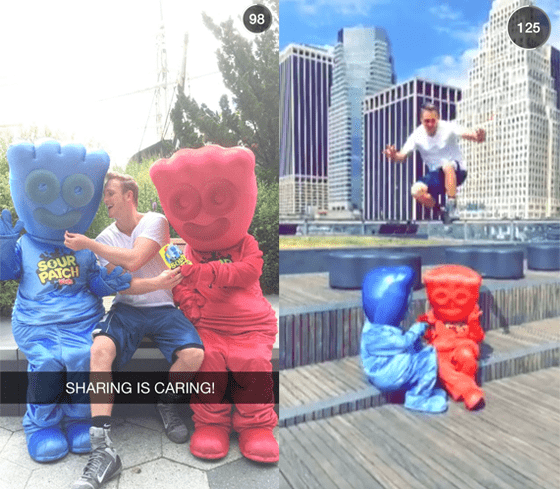 Sour Patch Kids partnered with an established and popular ‘Snapchat celebrity’ to promote their brand. Teaming up with comedian and social media influencer, Logan Paul, they tapped into his enormous following of teenagers and young adults. By doing this, they managed to increase their awareness in a creative way. ASOS use Snapchat to show viewers behind the scenes at exclusive events. During London Fashion Week, for example, ASOS snaps were viewed over 20 million times. They also send customers exclusive offers that disappear quickly. 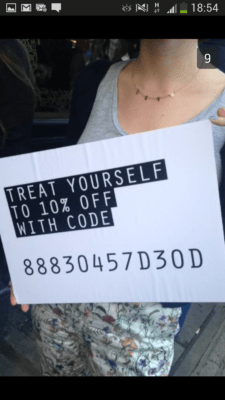 It’s the perfect way to get customers to ‘impulse buy’ and treat them to a discount. Gatorade went one step further with their Snapchat campaign. They partnered with the app to create a Gatorade ‘lens’ to coincide with the 2016 Super Bowl. A Snapchat ‘lens’ is a sort-of filter you can put over your pictures and videos. 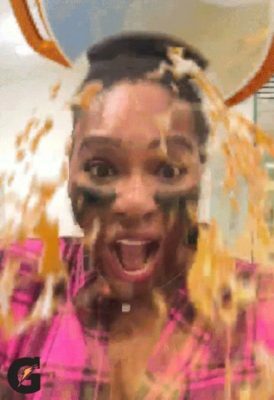 As you can see in the image above, Gatorade created a lens that let users send a picture of themselves being dunked with a drink cooler – just like coaches at the real Super Bowl. You can probably only try this if you have a huge advertising budget! However, it’s a good example of what can be done on the app. Okay, last one. The NBA recently used Snapchat to celebrate Kevin Durant’s ‘Most Valuable Player’ award. 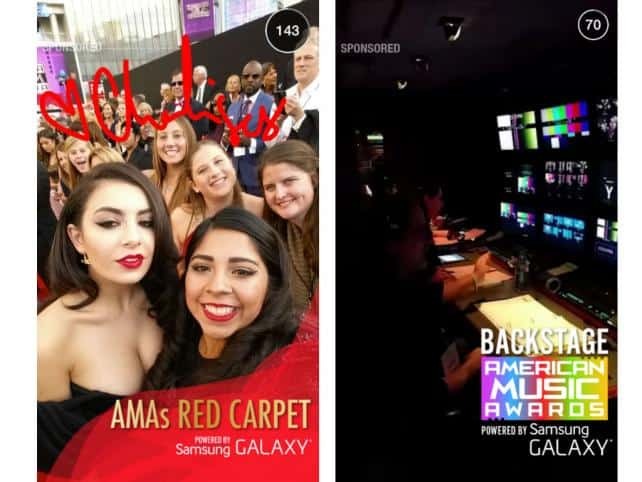 Using ‘Snapchat Stories’, they urged users to head to their website to watch the full stream. Snapchat is a useful way to cross-promote your products and services, and get your followers to take action. Now that we’ve seen how the big businesses are using the app, let’s dive into the real, actionable ways you can start using Snapchat. Social media has allowed brands to show even more ‘behind-the-curtain’ content than ever before. In other words, they can let customers into their world. We all love to get a glimpse behind the scenes, and this trick has worked very well for Asos, as we saw above. For a fashion seller, the ability to send snaps from exclusive fashion events, launch parties, and runway shows is a great way to connect with your target demographic. 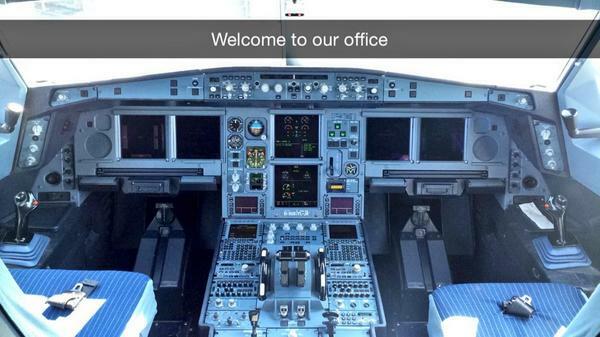 Airline company AerLingus are one of my favorites, using Snapchat to take followers into the cockpit of their planes. Of course, we don’t all have access to exclusive fashion parties or plane cockpits! But even letting your followers see behind the scenes in the office helps build a connection with your audience. Snapchat gives your followers a real-time ‘snapshot’ of your business. Let them in! Snapchat has always felt like a very private and exclusive space. Unlike Facebook or Twitter where all the world can see what you post, Snapchat feels much more like a direct, personal message. 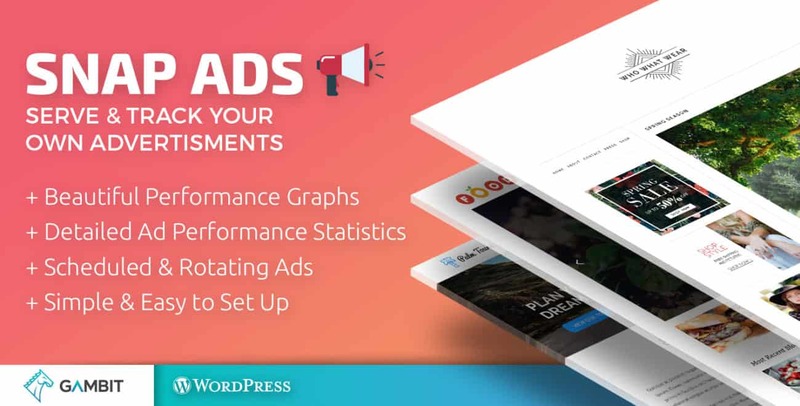 It puts it on a par with email marketing, where you can reach right into your followers’ world. That’s why the app is perfect for giving your followers access to exclusive content and announcements. It feels more personal, making a stronger connection with your followers. 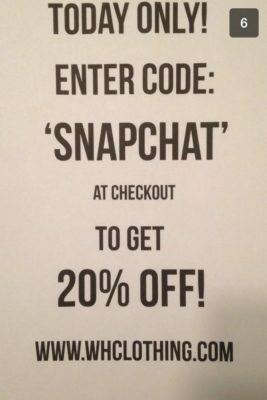 Again, fashion retailers are great at using Snapchat in this way. Some big-name fashion designers (like Rebecca Minkoff) have unveiled their collections on the app before they hit the catwalk, for example. For one of your followers, seeing a new product before the media is a huge thrill and a great way to build loyalty with your customers. In the past, we’ve talked about creating a sense of urgency to convince customers to buy products. By giving customers a time limit before an offer runs out, you can compel them to take action. You can do a similar thing by running a limited edition of a product (“only 8 left in stock!”) Tricks like this greatly increase the likelihood of making a sale. You can take advantage of this by sending your followers exclusive discounts and offers. First of all, it’s an exclusive deal, and your followers will feel like they’re getting special treatment. But secondly, that timer instantly gives the customer a sense of urgency. They’ll rush to write down the code, and hopefully rush to buy something from your store. Amazon has started using this trick on their Snapchat account, with really short time limits on the check-out time. It becomes like a race to get the deal! Just like on Facebook and Twitter, endless self-promotion is likely to turn your followers off. It’s a good idea to follow a ⅓ rule. In other words, only one third of your snaps or posts should be overtly self-promotional. With the other two thirds, use the opportunity to show off your personality and engage with your audience. 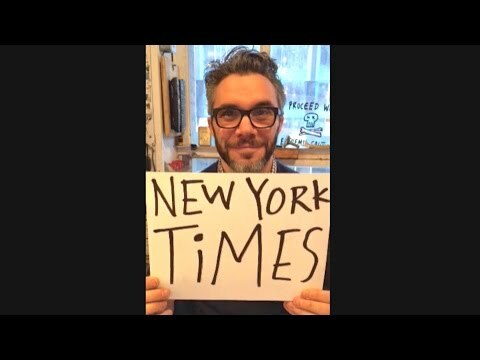 The New York Times are great at this. With a self-deprecating twist, they began by teasing themselves about their lack of expertise on the app. It came across as very personal and honest. Like other social networks, Snapchat works best when you interact and engage with your followers. One of the best ways to do this is by running competitions and asking for input from fellow Snapchat users. GrubHub (a food delivery service) has consistently been singled out as a Snapchat success story. In fact, in 2014, they had the highest Snapchat ‘score’ of any brand thanks to replying to every snap they received from fans. They also ran a hugely popular competition, asking followers to ‘snap them back’ with a food doodle. This is a super simple trick you can recreate with your followers. The rise of social media has seen an enormous rise in ‘influencers’, whether it’s YouTube vloggers, Vine sensations or Snapchat celebrities with followers in their millions. One way to reach a huge audience is to partner up with these big accounts to promote your product. I explained before how Sour Patch Kids used this trick by partnering with a famous comedian, but they’re not the only ones. 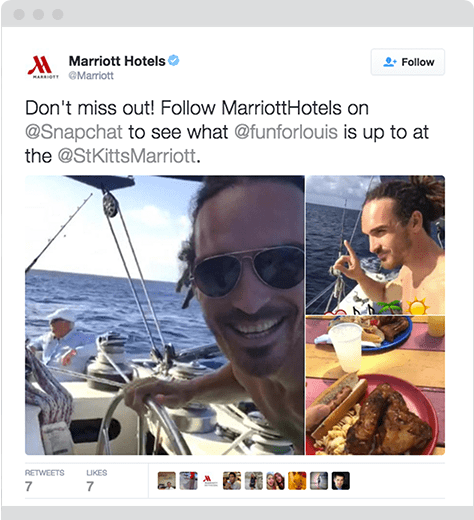 Marriott hotels hooked up with four different influencers in the travel niche to take over their Snapchat account. These four influencers used Snapchat to tell stories from all over the world, including a behind-the-scenes look at the exclusive opening of a new hotel in Hawaii. Most ‘influencers’ with thousands of followers are open to promotional content. Reach out to a handful of influencers in your niche and see if you can strike a deal. One of the most powerful features of Snapchat is the ‘stories’ section. Rather than posting just one self-destructing image or video, Snapchat Stories is more like a slideshow. This allows you to string multiple videos or photos together to tell a story. When Dominos pizza company joined Snapchat in 2016, for example, they kicked off with a long Snapchat story following the journey of a pizza delivery guy. On his way, he was abducted by aliens before finally delivering the pizza. This irreverent story actually increased sales directly, without any forcible advertising. By connecting with your followers in a natural, organic way, you can retain brand awareness and engage with customers. Ultimately, this translates directly into better business. Of course, building a presence on Snapchat takes time, just like any social media network. However, you can leapfrog the process somewhat if you’ve got an advertising budget. Snapchat’s advertising opportunities are still in their infancy, but it’s worth looking into. ‘Snap Ads’ are Snapchats most prominent ad program. It allows you to create a ten second vertical that appears in context with other apps. You’re also given the option to make it interactive and allows users to ‘swipe up’ to find out more information. Another option is teaming up directly with Snapchat to buy sponsorship of its live events feed, called ‘Our Stories’. Previous examples include Samsung who sponsored coverage of the American Music Awards. A similar initiative is purchasing sponsored ‘lenses’ and stickers (like Gatorade’s campaign, mentioned earlier). Lastly, you can team up with the brands on Snapchat Discover (typically media companies like National Geographic, CNN, and Buzzfeed who have a permanent presence on the app). You can then buy advertising space within their content. The beauty of Snapchat is that it is still evolving and growing. Brands are currently experimenting, and there is a huge untapped potential. Will it catch up with the enormous power of Facebook? Time will tell, but it’s definitely time to start building a presence there. Are you using the app to promote your business? I’d love to hear how you’re using Snapchat to interact with your followers.